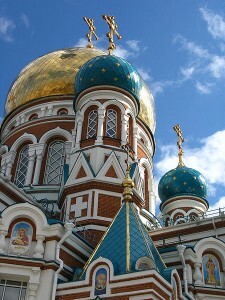 Omsk is the treasure city of Siberia. it is one of the biggest and oldest city of Siberia and located in its Western part. Omsk was founded as a fortress on the left bank of the river Om in 1716, during the reign of Peter the Great. Nowadays the gates remained from former strengthening as historical sites of the city. Lieutenant Ivan Buchgolz is considered to be the founder of Omsk. He has defined all stategic benefits of favorable location of the future city on merge of the rivers Irtysh and Om. Almost 2 centuries later Omsk became the intersection of the Trans-Siberian Railway. It has given a huge impulse for development of Omsk and its advancement on economic arena of the country. In the South Omsk region borders with with Kazakhstan and in the North with Tyumen region, which is famous as an oil producing area. Omsk companies production is always in demand there. Omsk is the second most populated city in Siberia and the with the population of approximately 1.3 mln Omsk is by right considered to be one of Siberian cultural centers. There are 9 theaters in the city and over 10 museums. The most popular theatre and the oldest one is the Drama Theatre which was established in 1876. Outstanding plays and many national honoured artists of Russia – everyday for you to enjoy. More than 1600 invaluable pieces of art collected Vrubel’s Museum of Fine Arts are waited for new curious eyes. The museum was founded in 1924 and measured as one of the Russian biggest art museums. Omsk region includes 6 towns and each of them is in its own way remarkable.